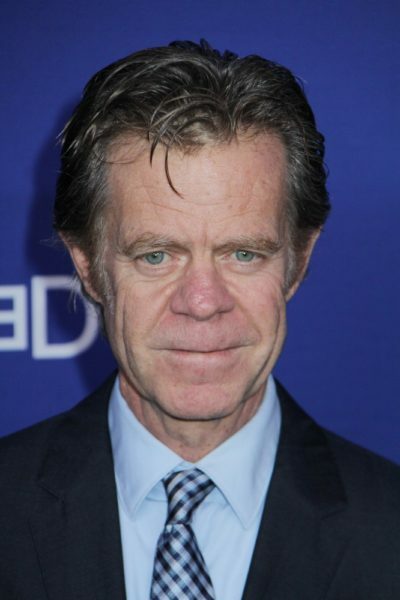 Birth Name: William Hall Macy, Jr.
William H. Macy is an American actor, teacher, writer, and director. He is the son of Lois Elizabeth (Overstreet) and William Hall Macy. He is married to actress Felicity Huffman, with whom he has two children. William often talks about his Lutheran faith. William’s patrilineal line can be traced back to Thomas Macy, who was born, c. 1605, in England. Thomas was among the early European owners and settlers of Nantucket, Massachusetts. William’s paternal grandfather was Albert Hall Macy (the son of William Henry Macy and Emily de la Montagnie). Albert was born in New York. William’s great-grandfather William was the son of John I. Macy and Jane Hall. Emily was the daughter of William de la Montagnie and Cornelia McMullen. Through his Macy line, William is a distant cousin of Rowland Hussey Macy, who founded R. H. Macy & Co. (now Macy’s), and of actor Ethan Hawke. William’s paternal grandmother was Elizabeth Cowan Somerville/Sommerville (the daughter of John Somerville and Clementine Cowan McLeyne). Elizabeth was born in Maryland. John was Scottish, from Cambusnethan, and was the son of John Somerville and Agnes Russell. Clementine was of mostly or entirely Scottish descent, and was the daughter of John McLeyne and Katharine Cowan. William’s maternal grandfather was Clement Overstreet (the son of Ellis G. Overstreet and Isabelle/Isabella Elizabeth Quave). Clement was born in Mississippi. Ellis was the son of Jacob H. Overstreet and Sarah Elizabeth Loper. Isabelle was the daughter of Ursin “Ursant”/”Usant”/Justin DeCuevas/dit Quave, whose own grandfather was from Seville, Andalusia, Spain, and of Sarah Elizabeth “Mamie” Davis. William’s maternal grandmother was Lois E. Everitt (the daughter of Horace Benjamin Everitt and Martha Letitia/Leticia “Mattie” Roberts). Lois was born in Mississippi. Horace was the son of George Gaines Everitt/Everett and Mary Ann Mayers. Martha was the daughter of Aaron Roberts and Margaret Martha Hearn. William is a fourth cousin, once removed, of football player Brett Favre. William’s maternal great-great-great-grandparents, Pierre Baptiste Cuevas and Marie/Mary Louise Ladner, were also Brett’s maternal great-great-great-great-grandparents. Remove French-Canadian (can remain in the tags) and Acadian. All Cajuns are descended from French-Canadians, just as all French-Canadians are descended from the French, thus, Cajun/French is enough. And Acadian isn’t even a thing, everyone who has that in their ethnicity should have it removed. Completely agree like when they say Patrick Swayze is “Norman French.” Very silly. William’s maternal great-great-great-grandparents, Pierre Baptiste Cuevas and Marie Louise Ladner, were also Brett Favre’s maternal great-great-great-great grandparents. Other than 1/64 Spanish (from Seville, Andalusia), William has also French/Cajun (including French-Canadian/Acadian), Swiss-German and 1/512 Choctaw Native American ancestry (https://www.wikitree.com/wiki/Panyouasas-1). Now my question is about William’s paternal grandfather Bascum Horace Overstreet. Has any one looked into the Overstreet family to see if there’s a connection to Chord Overstreet the actor from Glee? Did a bit of digging, but was able to find out that chord William are distant cousins. They share the ancestry of Henry overstatement his wife Anne who came from England.